Our clients needed an architect in East Devon to provide them with a Full Architectural Service for their kitchen extension to a Grade II* listed thatched house in East Devon..
van Ellen + Sheryn were approached by the owners of a Grade II* listed house in East Devon, with the wish to improve and extend their home into the substantial garden setting. 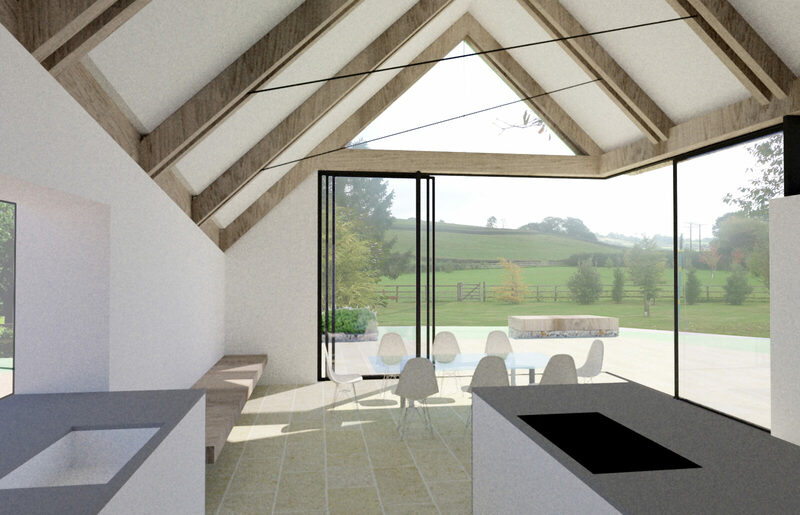 The existing kitchen provision was cramped; with low ceilings, poor layout, and no connection to the views out towards the Blackdown hills. The house is historically important in the local area, with areas of thirteenth century timber structure in the roof. 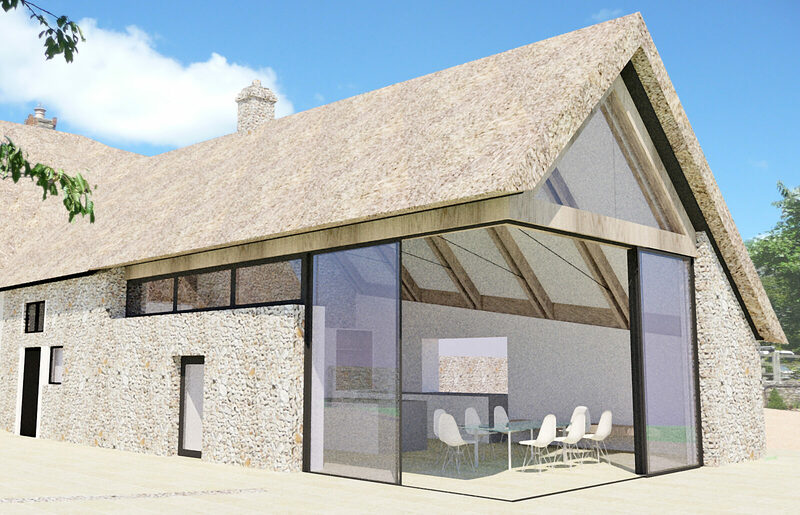 However, it had been unsympathetically adapted and extended on the garden elevation in the past, and the owners wished to remove these additions and create something new and unique whilst respecting the heritage and quality of the existing thatch and stone house. 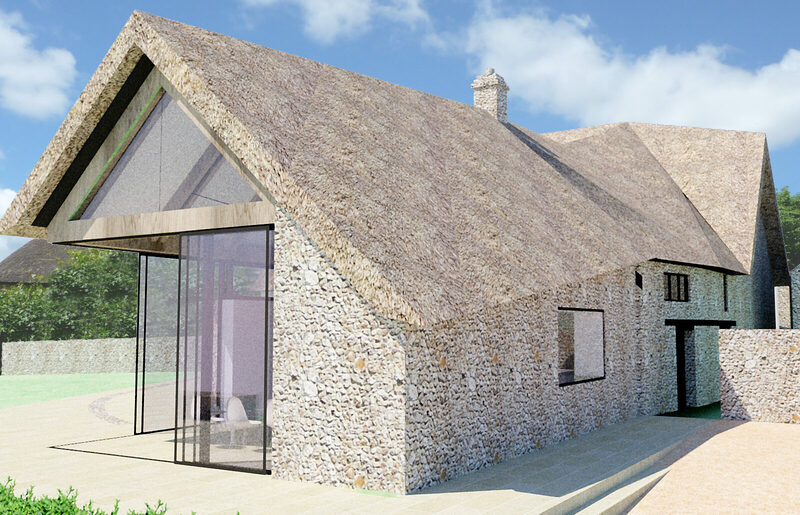 We soon arrived at the solution of a twisting thatch roof that extends out into the garden and rises up at one corner to provide volume and clear views out to the garden and countryside. 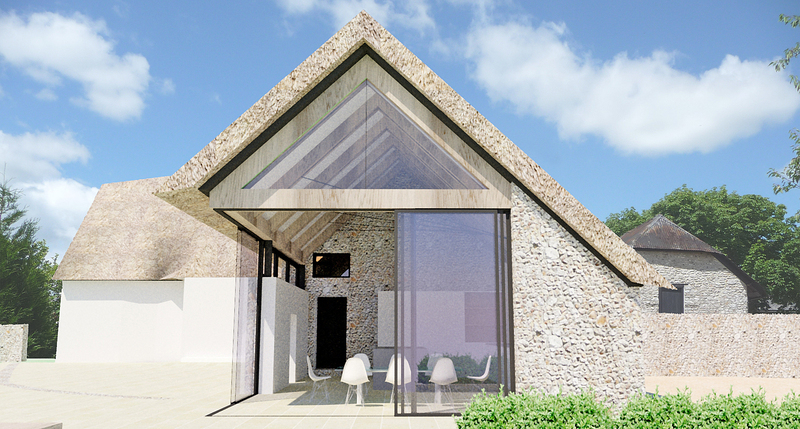 An oak truss structure, cleverly engineered, would cantilever and ‘hang’ the roof over a corner of structural glass and slimline glazing – combining very modern techniques and materials with the very traditional forms of thatch and timber frame. Chert (local flint) stone walls would extend out from the house and provide a buttress to this roof form, and a further material reference back to the original house. Whilst this is yet to be realised, we feel it a design of unique quality and character, and hope to explore a similar approach if the opportunity were to arise again. We engaged van Ellen & Sheryn in 2013 to assist with the design of and planning for a new build house in Totnes, Devon which my family and I now very happily live in. We worked mostly with Eilir Sheryn who showed enthusiasm, skill and experience in helping us navigate our way through the project. In particular he was willing and able to follow our brief in respect of design and budget which, in our experience, not every architect will do. All of the staff at the firm are personable and professional and we would not hesitate to recommend them ( we have on two occasions ) and we are in fact currently discussing a new project with Eilir. Upon completion our house was featured in Homebuilding & Renovating magazine and will also appear the TV series ” Building the Dream ” sometime in 2016……….testament to a job well done.